Jamie Hendry, MJE Productions, Josh Gilinski and the Theatre Royal Plymouth, present a World Premiere of a Musical based on the novel by Kenneth Grahame; the perennial children's favourite, Wind In The Willows. Although, I say a children's favourite, it is loved by children much older too; and perhaps even more surprising is my admission that whilst the storyline and characters are nevertheless familiar to me, I have still yet to read the book. The story in this Musical puts Mr Toad very much in the protagonist position as we see him go from travelling in slower vehicles to discovering fast motor cars. He then steals one such car and subsequently crashes it, meaning he comes before a court and is sentenced to serve 20 years in prison. He escapes, with the help of a washer-woman, and returns to claim back Toad Hall which has been taken over by the rebel forces of The Dark Wood, namely the weasels and the stoats. The sub-plot involves the capture of a young otter by the weasels and her detention in Toad Hall, and so Mrs Otter, Badger, Mole, Rat, and of course Toad march in on the squatters, fight them off and save both the young otter and the day! It's a lovely story; a fairy story perhaps, and certainly a story that can and should capture the imagination of youngsters. And indeed I am sure the book and certain adaptations of the book still do. I am uncertain however that this particular version is the vehicle for so doing. I enjoyed it immensely, as did most of the audience of my generation, adults. It was the adults who laughed at the jokes. It was the adults who were wowed by the superb acting; and it was the adults who clapped the loudest at the end with many standing for the ovation. It failed however to engender the same reaction with the youngsters in the audience, and they were plentiful. I left the auditorium wondering why this happened. It is essentially a Musical which should be engaging the children as well as the adults. There were children acting on stage alongside the ensemble cast. These children were excellent actually and deserve individual crediting, as they all had small solos - either dialogue or singing, all delivered perfectly. They were Charlie Birtwistle, Harry Cross, Imogen Dalton, Millie Kiss, Joshua Nicholls, Finn Richards, Sophie Trueman and Melodie Yates. However, even now, my dilemma as to the answer to this question is still unresolved. Is the book (Julian Fellowes) simply too adult in its concept and dialogue? Does the music (George Stiles and Anthony Drewe) become too majestic and operatic? I think maybe I could answer 'yes' to both those questions - despite a rather fun Rap sequence in the middle. Again, I really enjoyed the dialogue, and thought the music wonderful and uplifting; rather like an animal version of Miss Saigon. No, the book is very good indeed and I loved the music. Maybe then the answer lies in the costuming? The chorus / ensemble costumes being far more easily recognisable as the animals they represented than the principals. The hedgehogs, squirrels, mice and rabbits were well defined and obvious. Toad was green and suitably chubby; however I simply failed to recognise anything of the animals in the weasels, stoats, Mole, Rat, otters, and the only concession to Badger was the black and white flash in the hair. The anthropomorphism of animals is a very tricky one to get right, and especially when these animals react and interact with humans such as policemen, magistrates etc. I left the theatre therefore wondering if the costumes (Peter McKintosh) couldn't have been made a little more animal-like. Would this have helped? These though are only my own personal feelings and thoughts as I watched other audience members (especially the youngsters), to see how they reacted. As I said, I thoroughly enjoyed the Musical. Rufus Hound proved just what an excellent comedy actor he really is, investing all of himself and more into the role of Mr Toad. What a huge pity his singing voice wasn't really up for the challenge, but his acting and movement made up for this. Thomas Howes was Rat; and was simply perfect. David Birrell was an upright and commanding Badger with a touch of Prospero about him. Fra Fee made an amiable and capable Mole, and Sophia Nomvete was Mrs Otter (a role I think would have benefited from a solo Gospel style song). The head of the rebels, Chief Weasel was played with evil relish, reminding me very much of the character of Rooster in Annie; and the wayward young Miss Otter, Portia, by Holly Willock, making her professional theatre debut, and doing a wonderful job. All the cast were extremely talented and the quality of singing and acting superb. The direction (Rachel Kavanaugh) was tight, sensible and well observed, and the choreography (Aletta Collins) was somewhat minimalist but what there was, was in keeping with the animal being portrayed. The set (Peter McKintosh) was designed with circles and arcs in abundance. It was an intelligent and interesting design, and I loved the many and various forms of transport which kept appearing. The white sports car and the Gypsy Caravan my favourites, although the huge and very realistic steam engine cannot be overlooked. Mole's home though looked much more like a Hobbit's, and I could hear the set being moved in and out too which was quite distracting at times. Overall though, I can only give the show a massive thumbs up. 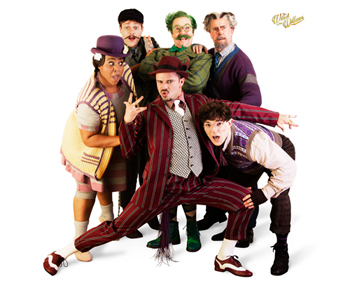 It is a wonderful new Musical and in a Musical Theatre scene predominated by American shows, so always pleasurable to see something home grown, especially when it is worthy of greatness, as indeed The Wind in The Willows is! It's a soaring score with great characters which will charm and delight for many years to come.